Franklin County Visitors Bureau is the season sponsor of the 66th season of Totem Pole Playhouse and invites the public to enjoy summer performances of "Lovesick Blues" "Six Dance Lessons in Six Weeks," "Forever Plaid," "One Slight Hitch, and A Funny Thing Happened on the Way to the Forum" at the playhouse in Caledonia State Park. 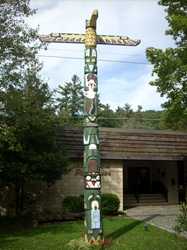 Totem Pole Playhouse is summer theatre at Caledonia State Park, Fayetteville PA.
Emmy Award-winning actress Loretta Swit, well-known for her portrayal of M*A*S*H's Major Margaret "Hot Lips" Houlihan, is starring in the opening show of Totem Pole's 66th summer season, 'Six Dance Lessons in Six Weeks." Emmy Award-winning actress Loretta Swit, well-known for her portrayal of M*A*S*H's Major Margaret "Hot Lips" Houlihan, is starring in the opening show of Totem Pole's 66th summer season, "Six Dance Lessons in Six Weeks," a touching comedy. Starring opposite Ms. Swit is David Engel, a veteran of numerous Broadway and Off-Broadway shows and a six-time Los Angeles Ovation Award winner. The comedy revolves around a formidable retired woman living in St. Petersburg, FL, who hires a much-younger, acerbic dance instructor to give her dance lessons – one per week for six weeks. What begins as an antagonistic relationship blossoms into a beautiful friendship while dancing the Tango, Waltz, Swing, Foxtrot, Cha-Cha, and Contemporary Dance. Michael Bloom, who ran the Tony Award-winning Cleveland Playhouse for 10 years, will direct the production. The comedy will run at the playhouse from May 27 through June 12. The show is sponsored by M & T Bank and Ludwick Eye Center. One of the most successful musicals in Totem Pole’s history, "Forever Plaid," will return June 17 through July 3, in an all-new production directed and choreographed by Christine O’Grady. The show features such 1950s classics as: “Three Coins in the Fountain,” “Heart and Soul,” “Moments to Remember,” “Perfidia,” and “Love is a Many Splendored Thing.” "Forever Plaid" is being produced by Theatre A Go-Go, Inc. and is sponsored by Edward Jones and Richards Orthopaedic Center. Los Angeles actress, Betsy Randle, who played Amy Matthews, the mom from the long-running 1990s ABC television series “Boy Meets World” will play the mother of the bride in comedian and actor Lewis Black’s new stage comedy, “One Slight Hitch.” Joining her as the father of the bride will be veteran TV actor, Granville Van Dusen. The bride-to-be is set to marry a conservative, straight-laced, all-American guy when her recent, long-time, free-spirited college boyfriend shows up at the front door apparently unaware of the day’s significance and refuses to go away. Rand Foerster, a long-time collaborator of Mr. Black’s will direct the play which also features New York actor and Chambersburg native, Jonathan Cable. The comedy is PG-13 for its subject matter, runs July 8 to July 24 and is sponsored by F&M Trust. Totem Pole's Producing Artistic Director Rowan Joseph will star in the Broadway musical "A Funny Thing Happened on the Way to the Forum" and Shane Partlow will co-star. Joseph and Partlow competed on Emmy Award-winning CBS reality series “The Amazing Race.” A non-stop laugh-fest, "Forum" is a joyous musical romp through Ancient Rome filled with desperate lovers, scheming neighbors, a bevy of beautiful courtesans, and secrets behind every toga. Totem Pole veteran and audience favorite, Paris Peet, will also star in the musical comedy opposite New York actress, Becky Barta. The show will run from July 29 through August 14 and is sponsored by the law firm of Walker, Connor & Spang. For the fourth year in a row the Franklin County Visitor’s Bureau is the sponsor of the entire 2016 summer season. Tickets can be purchased online at http://www.totempoleplayhouse.org or by calling the playhouse’s box office Monday through Friday, 9 AM-4 PM, at 717-352-2164.